Rent T2 + alcove apartment, 27 m² any comfort on the 2nd floor of a new residence (no lift). Located 300 m from the gondola of the Lys, 300 m from the city center and 500 m from the rock baths and spa Caesar. • 1 living room with sofa bed (in 140 cm Bultex mattress), 1 flat television 60 cm (USB port), DVD player and satellite decoder, free wifi internet access; kitchenette with stainless steel sink, dishwasher, induction hob (3 rings), extractor hood, mini oven, microwave, coffee maker, Nespresso, kettle, raclette grill, fridge top. The residence offers a free laundry room with washing machine, ski room with track dedicated to the apartment secured by a padlock, 1 private parking space reserved for the apartment. Non-smoking apartment and pets not allowed. For all arrivals on weekdays, arrivals between 09:00 - 12:00 and 14:00 - 18:00. If late arrival, please contact us beforehand to validate the feasibility of key delivery. Johann was an excellent host; he answered all our queries quickly and positively. The apartment was very well equipped with everything we needed for a week-long skiing trip for a family of four. The children particularly loved the raclette machine and bunk beds whilst the adults appreciated the cleanliness of the apartment and proximity to the ski lift and other amenities. Cauterets itself was a joy to discover and we hope to return next year. 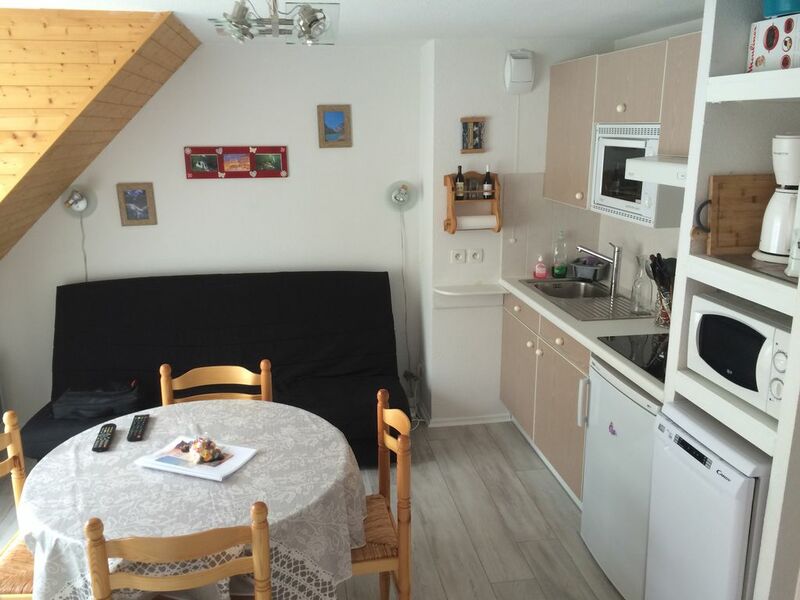 This apartment was perfectly suited to our 3-day exploration of Cauterets and the local mountains. Our hosts were very kind in greeting us, giving us an orientation to the place, and having a helpful information book about the apartment, restaurants and activities. The effieicent space was sparkling clean with everything we needed, including parking. It is ideally situated close to town and local walks. We fell asleep in the comfortable bed listening to the nearby stream. We highly recommend this charming apartment and gracious hosts for your visit. Worked well for 2 adults. Great hiking right out the door or a short drive/bus ride away. Not recommended if you're over 6' tall. appartement très fonctionnel, très bien situé. Bon accueil. Je recommande. Bien placé, 400m du télépherique, 300m du centre-vile.